Interpipe, the Ukrainian steel pipe and railway wheel producer, sees Saudi Arabia as one of the most stable and promising markets in the GCC. The kingdom accounts for one of its top three largest partners in the Middle East and North Africa (Mena) region where it has supplied around 24,000 tonnes of finished steel goods in 2017. In 2017, pipe deliveries to the Mena region grew by 17 per cent to 81,000 tonnes, gaining from increased sales volume in the key segments of construction and oil and gas industries. “Saudi Arabia is one of the most stable and promising markets in the GCC, and makes for one of our top three largest partners in the Mena region. Only in 2017, Interpipe supplied to local companies around 24,000 tonnes of finished steel goods,” Andrey Burtsev, commercial director for the Middle East, Africa and Asia markets of Interpipe said in a statement. 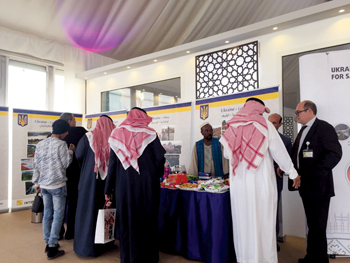 The company participated this year as the main partner of the Ukrainian Embassy in Saudi Arabia in Al-Jenadriyah, the largest annual cultural festival held near Riyadh. 2018 is the inaugural year of Ukraine’s participation in the festival, and marks the strong ties between the two countries both on a cultural and business level. “We are grateful for the opportunity to support the Ukrainian delegation in such a significant event for the cultural scene of the Kingdom of Saudi Arabia. Our goal is to introduce Ukraine as a reliable partner to Saudi Arabia in all aspects of our cooperation,” he added. “Al-Jenadriyah is the must-see cultural event, and we are honoured to represent Ukraine here. 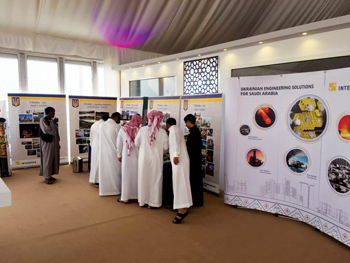 The Ukrainian national pavilion welcomes festival visitors for the first time, and aims to raise interest among them on the history and cultural heritage of Ukraine and increase the country’s potential as a tourist destination,” commented Vadim Vakhrushev, Ambassador of Ukraine to Saudi Arabia. “Ukraine and the Kingdom have strengthened the diplomatic and business relations between them during the past few years as confirmed in the course of the recent visit of the President of Ukraine Petro Poroshenko to Saudi Arabia. Interpipe’s growing operations in the region is one example of those positive dynamics,” he added. The company has made major contribution to infrastructure projects in the region with the premium pipe products in various applications, including steel structures, fire-fighting, heating, ventilation and chilled water. Particularly, Interpipe participated in the construction of King Abdulaziz International Airport, King Abdullah Financial District, King Abdullah Economic City, Jeddah Gate Development in Saudi Arabia as well as numerous residential and commercial buildings in the UAE, Qatar and Kuwait. The Ukrainian industrial major increased sales of its pipe and railway products by 35 per cent in 2017 to 767,000 tonnes as compared to 2016. According to the company statement, this is the best result in the last three years. The share of exports in the overall sales structure remained at 75 per cent. The sales of pipe products rose be 31 per cent as compared with 2016 and amounted to 595,000 tonnes. Ukrainian, American and CIS markets became the major areas of growth, it said. Combined sales in the Americas totaled 90,000 tonnes, up from 43,000 tonnes in 2016. Due to the oil and gas production raise in the US after the market stagnation in 2015-2016, the company managed to get back to the sales level of 2014. Pipe sales in the CIS region rose by 35 per cent and reached 140,000 tonnes. The Azerbaijan and Uzbekistan markets stabilising became the key growth factor. The oil prices growth provided local companies the possibility to resume oil and gas exploration and production projects that resulted into increase of OCTG procurements, it said. In Europe and the Middle East and North Africa (Mena), Interpipe recovered in sales volumes in the key segments of construction and oil and gas industries. The company supplied 136,000 tonnes of seamless and welded pipes to the European customers, up by 10 per cent, and the Mena region – 81,000 tonnes, up by 17 per cent. Sales of railway products, namely wheels, tires, axles, and wheelsets, in 2017 increased by 51 per cent to 172, 000 tonnes, with sales in CIS at 89,000 tonnes, up from 55,000 tonnes, and in Europe 23,000 tonnes, up by 11 per cent. Pipe deliveries by Interpipe, the Ukrainian steel pipe and railway wheel producer, to the Middle East and North Africa grew by 17 per cent to 81,000 tonnes in 2017, gaining from increased sales volume in the key segments of construction and oil and gas industries. The company supplied 136,000 tonnes of seamless and welded pipes to the European customers, up by 10 per cent. Modernisation of the rolling stock by Ukrzazliznytsya became the major demand driver for railway products in Ukraine. A considerable growth in car repairs and the revival of the car-building allowed the company to increase its sales at the domestic market by 83 per cent, to 45,000 tonnes. Almost a half of this volume was supplied to Ukrzaliznytsya. However, sales volume in Ukraine is still far from previous years’ figures, e.g. in 2011 and 2012 the domestic market consumed approximately 130 thousand tonnes per year. The CIS wagon-building and wagon-repair markets also increased due to the write off of out of date wagons and growing need in repairs of the rolling stock built 5 to 7 years ago. Railway products supplies to the European market also showed a certain growth in 2017. Due to the implementation of the strategic investment programme, the company managed to substitute a major part of its deliveries of rough machined wheels to Europe with a more technologically complicated product finish machined wheels. In 2017, Interpipe launched the serial production of wheelsets in Ukraine and carried out the first supplies to the Turkish and Iranian markets. In total, the company delivered about 1,050 wheelsets assembled at the in-house facilities. Production volumes for round steel billets reached 850,000 tonnes, which is 38 per cent higher than in 2016. This output growth was driven by increase in the number of orders as well as effect of the scrap metal duty. Almost all steel billets amount was supplied to Interpipe mills, and only 23,000 tonnes were delivered to other consumers. The company procured 720,000 tonnes of scrap for the steel production (third-party scrap, excluding Interpipe Steel internal scrap and the scrap received from Interpipe pipe mills). The raw material deficit went down, as compared with last year, to 5 per cent of the demand (from 7 per cent in 2016) and amounted to 42,000 tonnes. Fadi Hraibi, Interpipe CEO, said: “The company showed its flexibility and seized the opportunities appeared in 2017, resulting a growth across all sales regions. We hope to keep such trend this year. We are following ours way, which means continuing to invest into equipment and R&D and enhance of the operating performance. At the same time, a number of external factors, namely a metal scrap shortage, emergence of new trade barriers at export markets, oil price fluctuations, and lack of the production personnel, can have a negative impact on the business”.